Baby’s skin is especially delicate — it’s 30% thinner than adult skin and still developing — making it more vulnerable to damage and dryness. But it’s not just a baby’s body that needs extra special care. Did you know that the scalp is one of the most sensitive areas on your baby’s body? That’s why the best baby shampoo should moisturize as well as cleanse. 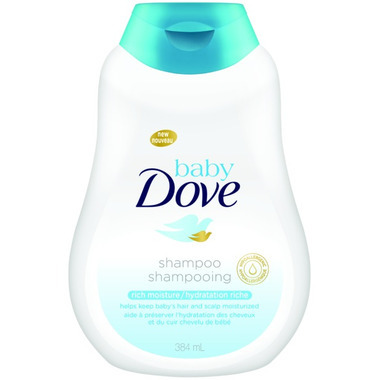 Baby Dove Rich Moisture Baby Shampoo goes beyond mildness to help retain moisture and replenish the essential nutrients that your baby’s scalp can lose at bathtime to leave hair soft and healthy looking. Tear free and pH neutral, their baby shampoo is ophthalmologist-, dermatologist- and pediatrician-tested, so you can enjoy bathtime knowing that your baby is getting the care they need. Hypoallergenic and mild cleansers in Baby Dove Rich Moisture Baby Shampoo help your baby’s hair feel soft and delicately scented. And after bathtime? You’ll both be ready for that snuggle before bedtime. For a complete bathtime experience, pair shampoo with our Baby Dove Tip to Toe Baby Wash and Baby Dove Baby Lotion. The trio of products is everything you need to ensure baby’s skin stays clean and moisturized – thanks to Dove, a brand you can trust. Hugs & Kisses Fragrance: Opening with a gentle freshness of lilac, apple and pear blossom, these bright top notes move into a tender heart of rose petals, white jasmine and peony for a delicate floral burst that envelops you and baby. As the scent develops, it settles into base notes of soft musks and creamy sweetness, cradling baby in a warm, bright scent that lingers on their skin. And each product spotlights the fragrance differently: Soft notes of flowers and musk scent our baby bar, and leave the rich, creamy lather beautifully warm and soothing, too. As you smooth our baby lotions into baby’s skin, a fruity sparkle settles into a soft, caring fragrance with the notes of white jasmine and rose petals. Baby Dove's gentle, caring fragrance is uniquely designed to blend with and enhance your baby’s own natural smell, making it just right for your baby’s delicate skin.